Homily - 28 May 2017 - The Ascension of the Lord - Is it any wonder the Apostles stared into the sky? As we celebrate today the Ascension of the Lord Jesus Christ to the right hand of the Father, Holy Mother Church presents for us two principle articles of the Christian faith: the divine authority of Christ and the Last Judgment. The two are, of course, connected to each other and to today’s solemnity when the “Lord Jesus, the King of glory, conqueror of sin and death, ascended to the highest heavens, as the Angels gazed in wonder.” Today, he “mounts his throne amid shouts of joy;” the “great king over all the earth” now “sits upon his holy throne” (Psalm 47:6; 47:3; 47:9). the hiddenness of God who, in his very hiddennes, is close to us and exercises his power for us; who is always beyond our reach and yet always in our midst; who eludes our every attempt to lay hold of him and manipulate him, but by that very fact exercises a providential rule over us all. Is it any wonder, then, that the Apostles simply stood there “looking intently at the sky as he was going,” for in the mystery of the cloud the Lord Jesus revealed the fullness of his divine power (Acts 1:10)? He made this explicitly clear when he said to his Apostles, “All power in heaven and earth has been given to me” (Matthew 28:18). Having ascended to his heavenly throne, the Father “put all things beneath [Jesus’] feet and gave him as head over all things to the church, which is his body, the fullness of the one who fills all things in every way” (Ephesians 1:22-23). 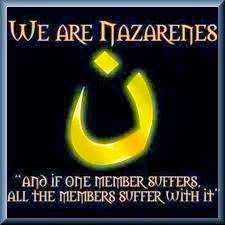 The Eleven were overcome with wonder and awe, with faith and hope, with a desire to be with their Lord, to follow him who said, “I am with you always (Matthew 28:20)” Is this not our desire as well? Do we not wish that we could have been present with the Apostles, to see with them the Risen Lord ascend to his glory? Do we not, too, wish to be with Christ the Lord? Is it any wonder, then, that they stood there gazing intently at the sky? The medieval manuscripts perhaps portray this best. 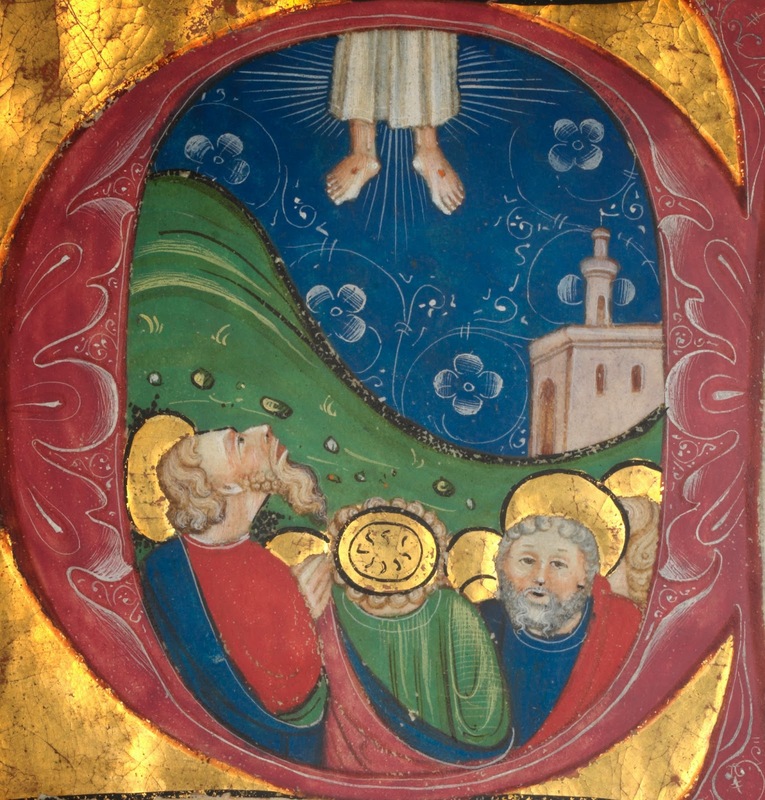 They show the Apostles gathered together outside with a cloud above them at the top of the image. From out of the bottom of the cloud extend two feet with nail marks and sometimes the hem of a robe. Jesus has just told them, “I am with you always” and then he goes up with the cloud. How were they to make sense of this? Does his Ascension not contradict his words? Here we come to the Last Judgment, for we know, as the angels announced, “this Jesus who has been taken up from you into heaven will return in the same way as you have seen him going into heaven” (Acts 1:11). When he comes again, he will come to judge the living and the dead, to judge us according to the measure of our love; we will be judged on how closely our hearts resemble his most Sacred Heart. Those whose love is worthy will be brought into the presence of the Father, into what we call heaven, to dwell with him forever. We cannot forget that at the moment of our deaths, we will each stand before the throne of God and face our particular and individual judgments, which will be made known at the Resurrection of the Dead. We will be judged both for what we have done and for what we have failed to do, all in accord with the double command of the love of God and the love of neighbor. The thought of being judged by the Lord often inspires a certain fear in many people as they consider the prospect of death and the way they have lived. But the image of the Last Judgment “is not primarily an image of terror, but an image of hope… [I]t is an image that evokes responsibility, an image, therefore, of that fear that … has its place in love.” When we stand before the throne of God, justice and mercy will meet in the gaze of Christ Jesus. Before his gaze all falsehood melts away. This encounter with him, as it burns us, transforms and frees us, allowing us to become truly ourselves. All that we build during our lives can prove to be mere straw, pure bluster, and it collapses. Yet in the pain of this encounter, when the impurity and sickness of our lives becomes evident to us, there lies salvation. His gaze, the touch of his heart heals us through an undeniably painful transformation “as through fire” [I Corinthians 3:15]. But it is a blessed pain, in which the holy power of his love sears through us like a flame, enabling us to become totally ourselves and thus totally of God. In this way the interrelation between justice and grace also becomes clear: the way we live our lives is not immaterial, but our defilement does not stain us forever if we have at least continued to reach out towards Christ, towards truth and towards love… At the moment of judgment we experience and we absorb the overwhelming power of his love over all the evil in the world and in ourselves. The pain of love becomes our salvation and our joy. When we stand before his face, we will know that his power is the power of love, of love that is stronger even than death. The Seraphic Doctor tells us that Jesus took his body with him “so that, seated at the right hand of Majesty, he might show to the glorious face of his Father the scars of the wounds which he suffered for us.” This is why the angels gazed on in wonder and why the Apostles stood there staring into the sky. Jesus took his body with him so that we, too, might one day look upon the signs of his love. has entered into the inner life of God in a new and hitherto unheard of way. It means that man has found an everlasting place in God. Heaven is not a place beyond the stars, but something much greater, something that requires far more audacity to assert: Heaven means that man now has a place in God. Believing, hoping and loving with all [our] heart, with [our] whole mind, and with [our] whole strength, may [we] be carried to you, beloved Jesus, as to the goal of all things, because you alone are sufficient, you along are good and pleasing to those who seek you and love your name. Where he has gone, may we soon quickly follow. Amen! Roman Missal, Preface: Ascension I.
 William S. Kurz, Catholic Commentary on Sacred Scripture: Acts of the Apostles (Grand Rapids, Michigan: Baker Academic, 2013), 34. Saint Bede the Venerable, Commentary on the Acts of the Apostles, 1.9b. In Thomas C. Oden, et al, eds., Ancient Christian Commentary on Scripture, New Testament Vol. V: Acts (Downers Grove, Illinois: Inter Varsity Press, 2006), 11. Joseph Cardinal Ratzinger, Dogma and Preaching, Matthew J. O’Connell, trans. (Chicago, Illinois: Franciscan Herald Press, 1985), 62. Pope Benedict XVI, Regina Caeli Address, 21 May 2006. Saint Bonaventure, The Tree of Life, 38. In Ewert Cousins, trans., The Classics of Western Spirituality: Bonaventure: The Soul’s Journey into God, The Tree of Life, The Life of St. Francis (Mahwah, New Jersey: Paulist Press, 1978), 162. Joseph Cardinal Ratzinger, Dogma and Preaching, 62-63. Saint Bonaventure, The Tree of Life, 48. Many moons ago I shared with you the news that Leonardo Defilippis of St. Luke Productions was in the process of writing a screen play on the life of the Servant of God Father Augustus Tolton. The screen play was finished some time ago and Mr. Defilippis spent several months searching for the just the write actor to portray Quincy's first citizen. That man has now been found, Andrae Goodnight. Now, at long last, the one-man play Tolton: From Slave to Priest is ready for performance! His Excellency the Most Reverend Thomas John Paprocki, Bishop of the Diocese of Springfield in Illinois, has asked me to work on bringing this performance to central Illinois, which I will be most happy to do. I will keep you updated as to when and where you will be able to see this drama, as well as how you might be able to help bring Mr. Goodnight to our diocese. If you wish to bring the play to your area, you can do so here. Please keep this play, and all of the excellent work of St. Luke Productions, in your prayers. As is well known, one's Twitter feed can be filled with much that is ugly in this world, but what is less well known is that one's Twitter feed can also be filled with much that is beautiful in this world. This is why I follow, among others, a number of medievalists who tweet out images from some of the great manuscripts. Among these is Kathleen McCallum, who enjoys "life in the margins" and tweets images of what are known marginalia, images found in the margins of medieval texts. The image comes from what is called the Hours of Yolande of Flanders, made somewhere between 1353 and 1363 and now housed in the British Library. The image is found in the left margin of a page principally depicting the Visitation, which you can view here. If you compare these two images to the image of Saint Veronica as depicted in your parish church's Stations of the Cross, the face on her veil will more likely show Jesus' eyes and mouth as both closed, which is not what we see in the above images. In fact, in nearly every depiction of the Veil of Veronica before 1527, the eyes and mouth of Jesus are shown to be open because the artists clearly used the Veil of Manoppello as their model. After 1527, when the Volto Santo was taken from Rome during the sack by the German emperor to Manoppello, artists began to use the image of the Shroud of Turin as their model for the face of Jesus, hence the eyes and mouth of Jesus began to be depicted as closed in artistic renderings of Saint Veronica. Every now and again you'll find an image of her veil made after 1527 that shows Jesus' eyes and mouth as open, a sign the artist knew something of the Volto Santo. How can I ever express the happiness of the marriage that is joined together by the Church, strengthened by an offering, sealed by a blessing, announced by angels and ratified by the Father? ...How wonderful the bond between two believers with a single hope, a single desire, a single observance, a single service! They are both brethren and both fellow-servants; there is no separation between them in spirit or flesh; in fact they are truly two in one flesh and where the flesh is one, one is the spirit. All of this will be brought about today by the Lord’s grace and favor. On behalf of Bryan and Ashley, I greet you, their ohana (family) and friends, with much aloha and I welcome you in the name of Christ. I thank you for the love, support, and encouragement which you give them by your presence today and which you have shared with them in the previous days, weeks, and years. I am confident they will be able to count on you in the days, weeks, and years ahead for this same encouragement, support, and love. Now, my friends, before we witness the exchange of their promises to live the remainder of their lives together in committed love, I ask you to allow me to speak directly to the couple; you, of course, are welcome to listen in. Bryan and Ashley, among the words of profound spiritual counsel Saint Marianne Cope has left us, we find some words that you, no doubt, know well: “Creep down into the heart of Jesus.” The reason she tells us to do so is simple: “He alone can comfort you in your supreme hour of sorrow.” These might seem strange words with which to begin a homily for a wedding, but the truth of her words cannot be ignored, nor can the reality of marriage as a cross, in that marriage requires a daily renunciation of oneself in favor of the spouse. We know that “love is the foundation of everything,” including marriage and the Cross, but just as there is a temptation today to over-romanticize love, so is there a temptation to over-romanticize marriage, to think it will automatically bring about a life of bliss without any difficulties whatever. The reality, however, as any honest couple will tell you, is not quite so picture perfect. Marriage is difficult and requires compromise, patience, and gentleness, but when the difficulties of marriage are embraced, marriage is beautiful. Just as the Cross is difficult, so, too, can marriage be difficult; but in the same, just as the Cross produces joy within those who embrace it, so, too, does marriage (cf. John 15:11-13). Like the Christian life in general, marriage is simple, but it is not easy; marriage is simple because, at its core, it involves only one thing, namely, the acceptance of the Cross in imitation of Christ Jesus who “first loved us” (I John 4:10). In marriage, you, Bryan, must always put Ashley’s good before your own; likewise, you, Ashley, must always put Bryan’s good before your own. If you live in this way, you will indeed “be subordinate to one another out of reverence for Christ” and your married love will shine like a great light upon all who see you (Ephesians 5:21). All of this, of course, requires a repeated and continual embracing of the Cross. Faithfulness in Christian marriage entails that: great mortification… No man, however truly he loved his betrothed and bride as a young man, has lived faithful to her as a wife in mind and body without deliberate conscious exercise of the will, without self-denial. Too few are told that – even those brought up ‘in the Church’. 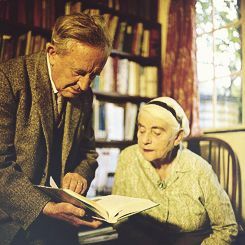 Tolkien here speaks of a danger for the groom in marriage, but lest some think marriage brings no danger for the bride, we might note also the temptation of the wife always to be right. Marriage, for her, too, requires deliberate conscious exercise of the will, that is, self-denial. I do not want the two of you to be unaware of this; this is why I began with Mother Marianne’s counsel to creep down into the heart of Jesus, for his Sacred Heart is always intimately connected with his Cross. How fitting, then, even providential, that you begin your married life together in this church dedicated to that Heart that was pierced in love for us and remains open for us as a safe harbor in the storms of life and a happy hale (home) in the joys of life. As you help each other creep down further into the heart of Jesus to conform your hearts ever more closely to his own, you will help each other to become saints, which is, of course, the first and primary purpose of marriage. You will help each other to shine like lampstands in a world that too often seems filled with much darkness. We know that “when we as Christians fail to be saints, when we fail to live the beatitudes and be light, the world suffers.” Strive, then, to “let those you illumine by the light of your words be seasoned by the salt of your good works.” If you help each other to live in this way, you will be true a husband and a true wife. 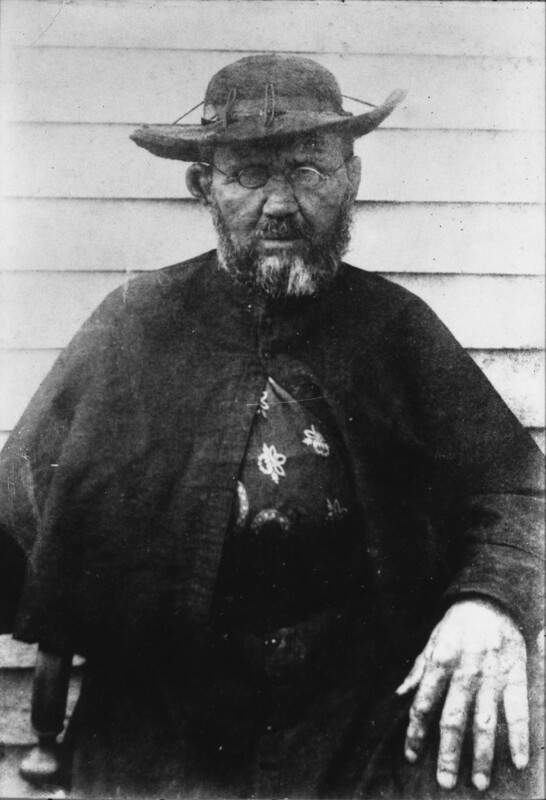 As you help each other to daily creep into the heart of Jesus, do not forget these words of Father Damien: “To have begun is nothing, the hard thing is to persevere. This is the work of God’s grace. That grace will never fail me, I am sure of that, provided I do not resist it.” Help each other to persevere in love and the grace of God will never fail you. What is more, your lives joined together as one will be like that great multitude in heaven continually crying out, “Alleluia! Salvation, glory, and might belong to our God” (Revelation 19:1). It will be as if you say to each person you meet, “Praise our God, all you his servants, and you who revere him, small and great” for you “have been called to the wedding feast of the Lamb (Revelation 19:5, 9). If you recognize that you, too, have been called to that same heavenly feast and are called to reflect him who is “the Light of the world,” you will indeed be light and you will be salt (John 8:12; cf. Matthew 5:13-14). From this day forward, may you, as husband and wife, together season the world with acts of mercy and shine the light of love upon those who do not know the beauty of the Sacred Heart. May you - and everyone who sees you - “live in love” (Ephesians 5:2). Amen. Tertullian, Ad uxorem, II.VIII.6-8. In Pope Saint John Paul II, Familiaris consortio, 13. Saint John Chrysostom, Homily on Ephesians 17.4.32-5.2. In Thomas C. Oden, et al, eds., Ancient Christian Commentary on Scripture, New Testament Vol. VIII: Galatians, Ephesians, Philippians (Downers Grove, Illinois: Inter Varsity Press, 1999), 173. J.R.R. Tolkien, Letter to Michael Tolkien, 6-8 March 1941. In The Letters of J.R.R. Tolkien. Humphrey Carpenter, ed. (Boston: Houghton Mifflin Company, 2000), 51. Curtis Mitch and Edward Sri, Catholic Commentary on Scripture: The Gospel of Matthew (Grand Rapids, Michigan: Baker Academic, 2010), 92. Anonymous, Incomplete Work on Matthew, Homily 10. In Thomas C. Oden, et al, eds., Ancient Christian Commentary on Scripture, New Testament Vol. Ia: Matthew 1-13 (Downers Grover, Illinois: Inter Varsity Press, 2001), 95.